Nice rhinestone and glass necklace with very little use in great condition. Owl Pendant 3.5". White/black Austrian crystal. With multi strand Chain 28" with 2" extender. In Silver Plated. Simulated pearl necklace. Chain Lengh: 45 5 cm (1"=2.54cm). It has a largeBlue CZ at the centre and18 small Clear CZ diamonds inlaid into the sides of the heart pendant. 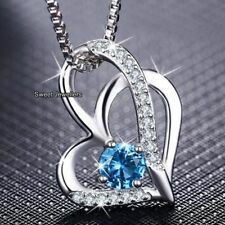 This is a stunning925 Sterling Silver plated necklace featuring aTwin Heart Pendant a beautifully crafted pendant design, featuringBlue & Clear Crystal Diamonds. Choker fastens with a silver-plated lobster clasp, and extender chain (as pictured). All images/photos are my own and are of the actual product sold. Ribbon width 16mm and is (100% Nylon). Otherwise will make to a standard 13" (33cm) length. 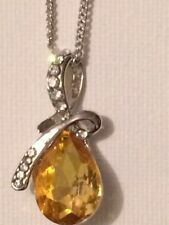 It has a Large8mm Clear Multi-Faceted CZ Crystal Diamond held in a 4-prong setting at the centre andSmall Fine Clear CZ Crystal Diamonds inlaid into the pendant around the Large Crystal Diamond at the centre. Bangle type choker, opened back allowing to fits most size. Multi 9ct 9K " Gold Filled " made with Swarovski Crystal Earring Xmas Gift E624. Make Supersized Seem Small. Get Images that. Description: Item style: Pendant Necklace Material: Silver Plated Main Color: Love White & Love Silver Size: Necklace Length 43-50 cm (1 inch = 25.4mm/1mm = 0.0393 inch) Package included: 1 set(Necklace,Pendant)(No retail box,packed safely in the bubble bags). Crystal Pendant Necklace. The necklaces are high quality and have great shine & sparkle. 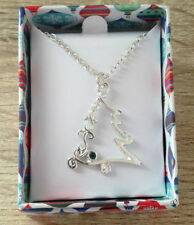 This is a stunningSilver plated necklace featuring a beautifully crafted pendant design. Very much in the flapper style - the necklace is long and approx. It fits over the head so does not require a fastener. This is the perfect accessory for a 1920s fancy dress party, ball/prom or wedding. This is a stunning925 Sterling Silver plated necklace featuring aLarge Heart Pendant a beautifully crafted pendant design, featuring sparklingCrystal Diamonds. The necklaces are high quality and have great shine & sparkle. 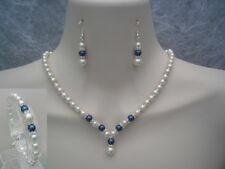 This necklace has white pearl beads in graduated sizes the largest of which is 16mm in diameter. These are interspersed with silver plated roundels set with iridescent rhinestones which really sparkle. The necklace is 56cms long and has a silver plated lobster clasp. FREE UK P&P Please Note.....The bust in the photos is not life size and makes the necklace look larger than it actually is. Length of the Necklace: 36 cm 5 cm Silver Extension chain. Ideal to wear with casual wear, Match with Black colour dresses. A little White colour plastic Pendant is beautifully attached in the middle. 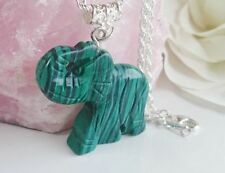 Silver plated skeleton on a blue turquoise pendants on black cord. New listingCream White Pearl Beaded Drop Chain Necklace & Bracelet With Gift bag..
Ladies Pretty Cream White Pearl Beaded Drop Chain Necklace & Bracelet With Gift bag. Length of the pearl beaded chain drop: 6 cm. Made with Cream White 8 mm Glass faux pearl beads. Length of the Necklace: 44 cm 5 cm Silver Extension chain. Silver plated skeleton on a malachite ball pendant on black cord. All our fashion jewellery are nickel free in line with the EU standards. Very much in the flapper style - the necklace is long and approx. As it is long, it fits over the head and doesn’t require a fastener! This is the perfect accessory for a 1920's fancy dress party, ball/prom or wedding. Made with 6 mm Black Crystal beads, Black wire, silver lobster clasp and extension chain. Length of the Necklace: 39 cm 5 cm Silver extension chain. Colours: black, silver. A nice weight. A SILVER PLATED BUTTERFLY PENDANT & CHAIN SET WITH FAUX CRYSTAL DIAMONDS. Ladies Beautiful Grey Colour Crystal Ball Pendant Long Chain Necklace With A Gift Bag. 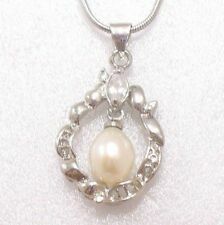 Size of the Large Ball Pendant: 2.5 cm 2.5 cm. Length Of The Necklace: 61 cm 5 cm Extension chain. 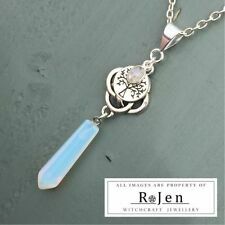 Pendant is A Grey Colour Crystal Ball. Choker fastens with a silver-plated lobster clasp, and extender chain (as pictured). Ribbon width 9mm (100% Nylon). All images/photos are my own and are of the actual product sold. Choker fastens with a silver-plated lobster clasp, and extender chain (as pictured). Handmade black Berisford velvet ribbon choker/necklace, with ivory glass pearl bead,hung from a silver-plated pendant bail, all other components are silver-plated. Ladies Stunning White Zircon And Crystal Square Pendant With Chain Necklace And A Gift Bag. White Zircon Stone Attached in the middle of the square Pendant and The white crystals attached around IT. Length of the necklace: 44.5 cm 7 cm Silver Extension Chain.